Now, I’m not usually one for pre-packed or pre-prepared food, packets of microwaveable rice take me back to my uni days before I’d learned how to cook rice without having to throw the pan away afterwards. I’ve since jumped well on board with Jamie Oliver’s absorption method and it’s never failed me. So pre-cooked rice became a thing of the past. 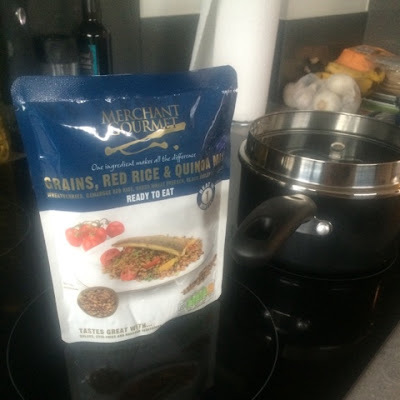 That is until I was buying some lentils the other day and a two for one offer on Merchant Gourmet tempted me to try out this grains, red rice and quinoa mix. I’m very on board with this whole new trend for ‘healthier carbs’. What seems like a million new grains have flooded the market, where cous cous was the ‘exotic’ option before it’s now old hat compared to quinoa, bulgur wheat, freekeh etc. I won’t go into all the added health benefits but to summarise, swapping your white rice for an alternative grain can offer you lower carbs, added nutrients, more fibre and in some cases lower calories. Sounds good to me. I really like quinoa, I’ve had it in numerous restaurants added to salads and vegetable side dishes for extra bulk and enjoyed it everytime. I often have cous cous at home so I haven’t really gotten around to giving quinoa a go myself. 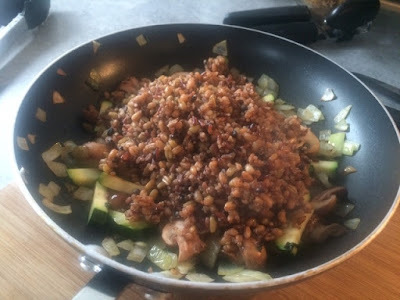 I liked the idea of this mix when I saw it included in the offer and thought it would be a good way to introduce quinoa into my diet without buying a large bag that ends up taking up cupboard space as I’ve run out of ideas for how to use it. I try to shove as many vegetables into my meals as possible so of course I wasn’t going to serve this on its own. 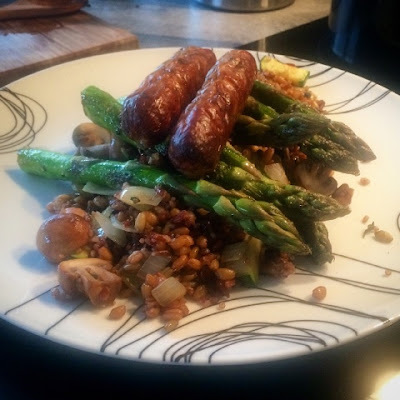 I planned to have it as an accompaniment to some sausages I needed to use up so I served some grilled asparagus on the side and sautéed up even more veg to mix in with the grains. I have to say I found the mixed grains a lot tastier than plain old white rice or cous cous and also a lot lighter and less stodgy. We’ve all had that bloated stomach feeling you get after eating a rice heavy dish, but there was absolutely none of that here. I’m going to see if Merchant Gourmet have some other grain mixes I can try and then perhaps get that bag of quinoa to go in the store cupboard. I don’t have a microwave but thankfully there’s a boil on the hob option and it only takes ten minutes. This worked out for great timing to get the rice cooked and all the veggies done while my sausages were sizzling away on the oven. Feel free to give this dish a go with any grains you like, just cook according to packet instructions. 2. Place sausages on a baking sheet in the oven for 20 minutes. 3. Bring a pan of water to the boil. 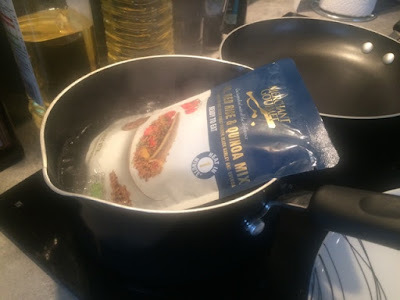 Place unopened packet of mixed grains in the pan and heat for 10 minutes. If you’re using different grains follow the packet instructions. 4. 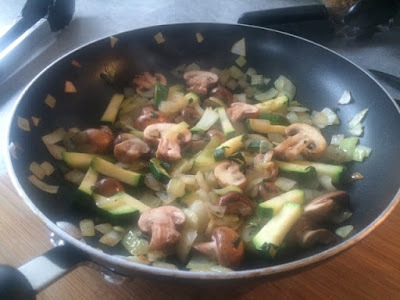 Heat a small amount of oil in a large pan and sautéed the onions until softened, then add the sage and courgettes cook for a further few minutes and finally the mushrooms until everything is cooked. 5. Empty the cooked grains into the sautéed pan, mix together and season well with salt and pepper. 6. Serve topped with asparagus and the sausages.